As I was making crepes this morning, Tyler was bustling around, busily stowing things away in our panniers. Normally I stuff my bolster-sized clothing bag and one of the Downmats into my own clothing pannier, but for some reason this morning Tyler decided to take care of it. He unbuckled the straps, unrolled the the top of the canvas, and opened the pannier. I heard a surprised "oh!" and then a sad "awwwwww" before Tyler explained what was going on. There, nestled peacefully in the soft folds of my fleece hoodie was a little (very recently) dead mouse. 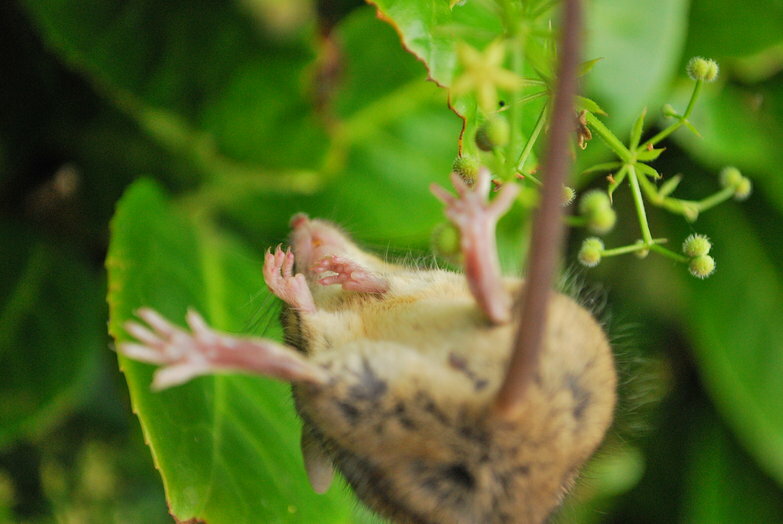 Tyler picked it up by the tail to show me, then proceeded to fling it into the bushes where it stuck to the side of the hedge, velcro-ed on by some cleavers plants. 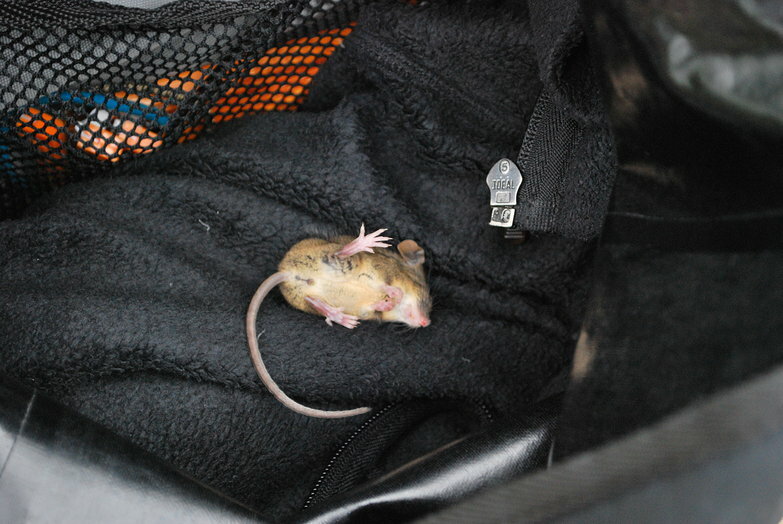 We had no idea how a mouse could have gotten into that pannier, it rarely stays open for very long. In any case, the poor little guy got trapped and must have perished of heat exhaustion or suffication. We think he tried to chew his way out, as there is now a tiny mouse-mouth sized hole in the side of my pannier. Rest in peace, mousey! Though I'm not squeamish at all, I was glad Tyler took care of the mouse situation. He emptied everything out, checking for other mice or mouse poops, and finding nothing, packed everything back up determining that I was good to go. With a final farewell to our little dead friend, we rode off to start our day. We were both excited to have a morning of perfect cycling weather—overcast with a slight chill in the air, offering much appreciated relief from the intensity of the sun. 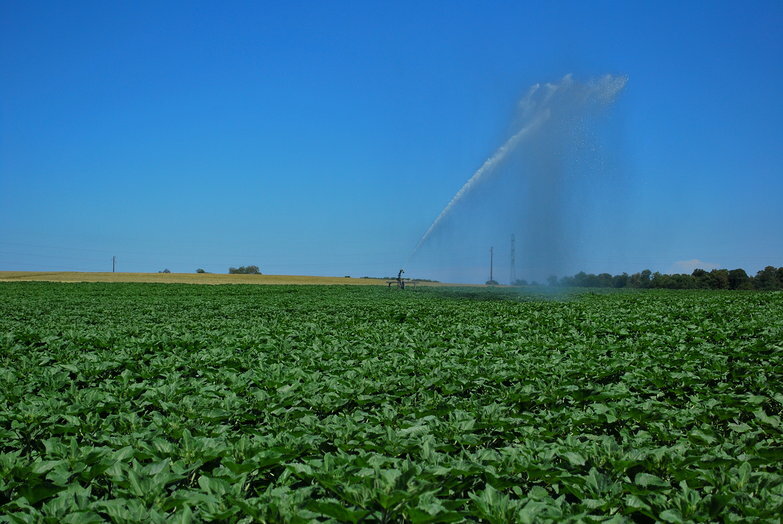 We listened to music as we ticked away the kilometers along empty country roads past field after field of corn, wheat, and what I think might turn out to be sunflowers, though I'm not sure. The sun was just making an appearance when we got stuck on a highway that was under construction. Normally French highways have wonderfully wide bike lanes beside them but this road had a steep 5-foot drop-off. The right side of the lane (normally a bike path) was piled with small gravel so we ended up having to bike in the middle. Thankfully, cars were understanding and gave us room despite the cramped space. After a few kilometers the construction ended and turned into a normal cycle-friendly French road. Hungry for lunch and dusty from our construction riding we planned to stop at the first bit of shade we could find. Just down the road Tyler spotted a tiny tunnel under a bridge connecting to a cycle route (it wasn't headed in our direction or we would have been on it). We wheeled our bikes under it, seeking refuge in the darkness. While we were sitting on our walkstools munching three touring cyclists rode by! They were German retirees we recognized immediately, as we had crossed paths with them on several occasions yesterday. 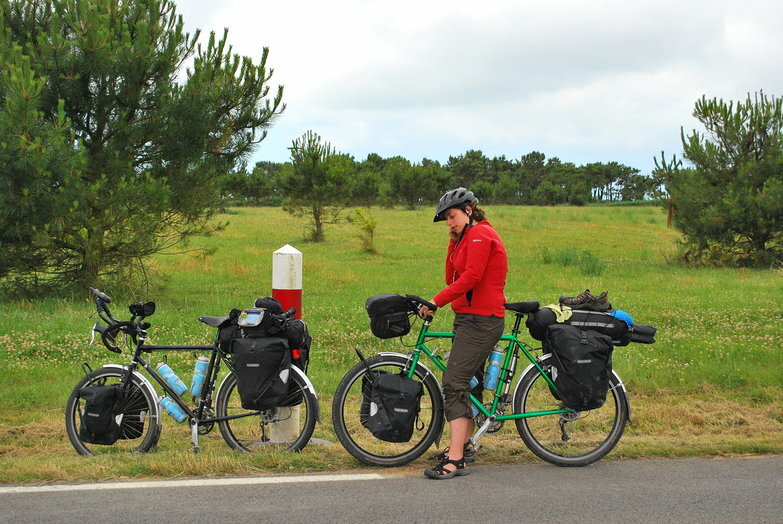 We wished them well as they cycled away on their three-week holiday. After lunch, we took to the roads once more, casually rolling along back roads through endless fields and farms. 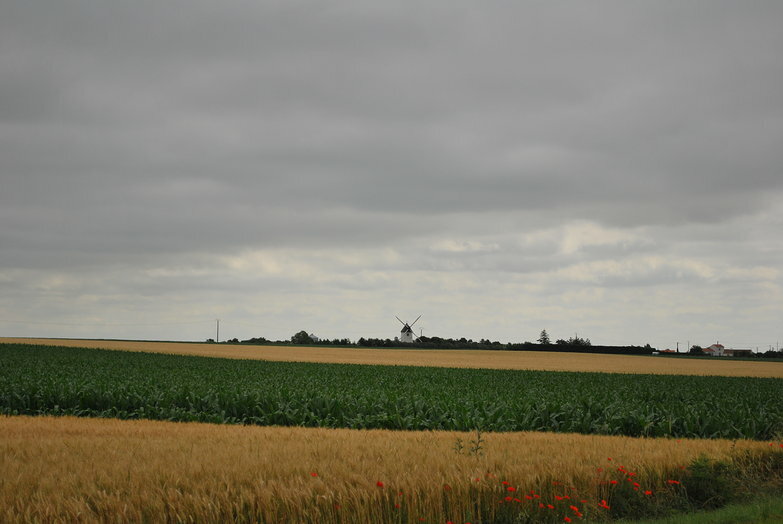 We passed a Don Quixote-esque windmill, and saw a giant sprinkler shooting misty beams of ethereal-looking water into the sky as we went. Intrigued by the sprinkler, we deviated from our route, taking a gravel, pothole ridden path through a field for half a kilometer or so to investigate the contraption a bit closer. Tyler was amazed by how similar it was to the tiny kind you stick into your lawn. Cool! 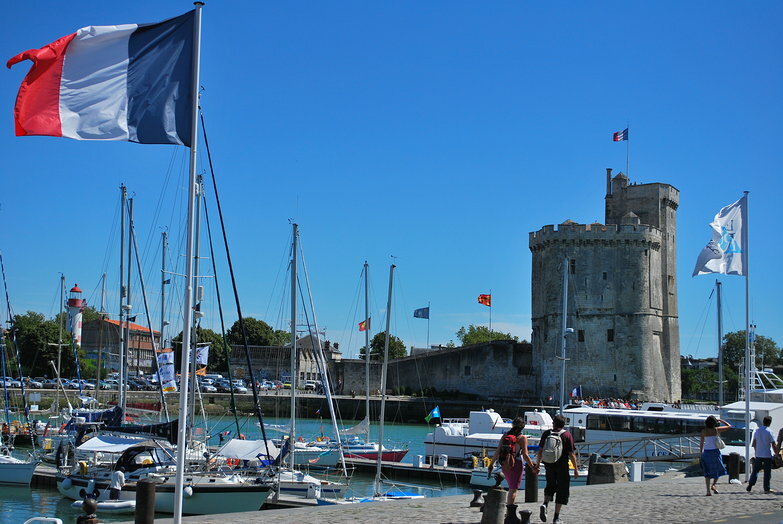 We were going to ride around La Rochelle today, as we we've taken to avoiding large cities lately. In the end we decided to go in anyway, hoping to find free internet to catch up on several days of journal posting. I'm glad we saw the city because it was just as I remembered it—beautiful sparkling water with fancy boats bobbing around, lanes of shady sycamore trees, and old stone buildings. We leaned our bikes up against the curb, and Tyler checked around for any unsecured networks. Nothing quick enough, so we made it to a McDonalds with the help of a very sweet French high school student. She yearned for travel, and I told her about the Rotary Exchange program. I hope it works out for her! We set up shop, arriving at McDonalds around 4pm. We had our first ICE WATER in 80 days, marvelling at the brilliant concept, posted our journals and then had ice cream as well. It was great! By the time we left to find a campsite we'd somehow wheedled away more than four hours, it was almost 9:00 PM. Fortunately it stays light here until nearly 10:30. We quickly found a few sites, the first of which was packed, the second being 25 euros a night and the third being "just right". Less pretentious, less expensive, and offering all we needed (read: space for a tent and a source of water). The note on the door said "If reception is closed, make yourselves at home!" and we did. It wasn't until Tyler tried to use the locked restrooms that our simple site started to feel a bit weird. The whole campground seemed deserted. The plots were overgrown. The toilet block looked like it hadn't been cleaned or used in years (Tyler found a door sitting ajar and was able to get inside), and there was no running water. Despite all of this there were several trailers and campers that seemed inhabited. There was even a large tent set up near ours. Oddly though, there didn't seem to be any people anywhere. While musing about the oddities of our campground my parents called (they do often and we love it!) and we had a really nice conversation. By the time we were through talking we were ready for bed. Unfortunately it was pretty difficult to get comfortable. The showers weren't working and we didn't have any water to help wipe away our rode grime. Somehow we managed to fall asleep, sweaty, sticky and clammy in our sleeping bag on top of our deflating and deformed air matresses. An odd end to an otherwise great day! 2014 - Thank You Hartmans! Hi guys. I'm a long time reader of your journal. I'm slowly re-reading all your old entries after having done a mini cycle tour across France a few weeks ago, comparing our experiences. My route was quite different to yours ( http://ridewithgps.com/trips/320102 ) but one thing I can relate to is the occasional weird campsites. I found a municipal site in a town called Pithiviers that was so run down. No reception to speak of (there was one building but it looked to be a house, no sign of life there or any signs to say it was the reception, for that matter. There were a few others around but they seemed to actually live there. One campervan cabin was full to the ceiling with papers and other trash, weeds overgrown around the wheels... The toilet block was almost non-functioning. Two toilets, one a squat toilet, the other flushing but with a non-working light and no windows, meaning you had a choice between doing your business in pitch-blackness, or doing it with the door open. Feral dogs, cats and chickens wandering at will. 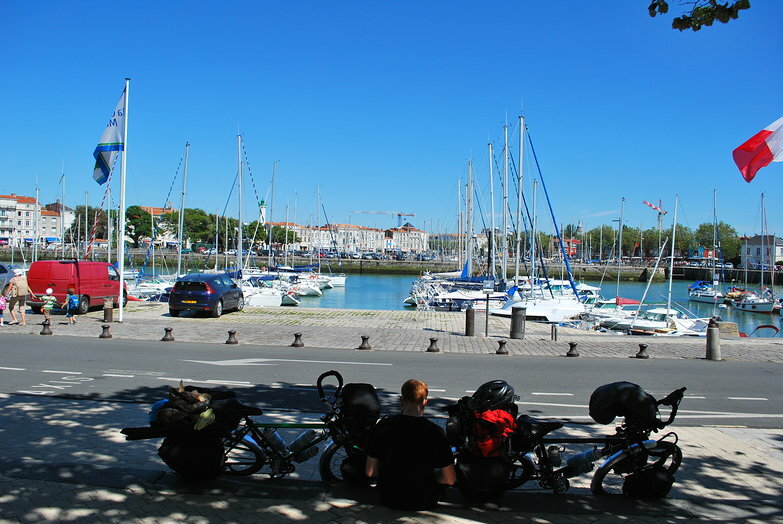 France has some really great, cheap municipal campsites but a few dumps too. :) But hey, it's all part of the experience! It must have been great to have each other to prop yourselves up during the tough days. I did my trip solo with virtually non-existant French!